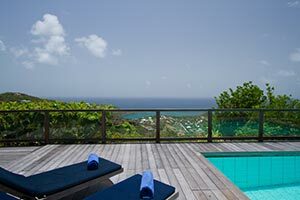 Nestled in the Vitet hillside, St Barts, UJV 260, also referred to Tranquille, is a very private, very quiet three bedroom villa surrounded by spectacular tropical gardens. The view is breathtaking and you feel as though you are on top of the world. Built on two levels, the master bedroom is in a separate bungalow above the main house. There are terracotta floors throughout the villa and terraces. The rooms are bright and airy with gentle breezes flowing through them. In front of the villa, there is a covered terrace with a balcony and a good size pool and pool house. From wherever you are in this charming villa, you can enjoy the incredible views over the turquoise lagoon of Grand Cul de Sac, Petit Cul de Sac, Marigot Bay, Mont Jean and the surrounding islands. Villa UJV 260 offers easy access and with the second private bungalow, it is perfect for families or friends.